Opening up for Greta Van Fleet were LA Alt-rockers Dorothy, which is comprised of Dorothy (vocals), Owen Barry, Leroy Wulfmeier, Eliot Lorango, and Jason Ganberg. With some modern day classic rock vibes, they were the perfect band to get everyone ready for Greta Van Fleet later that night. I am always on the lookout for some good new music and their 10-song set definitely made me a fan. Opening with “White Butterfly” and burning some sage (I think that’s what it was), everyone was loving the good vibes in the room. The rest of the set contained “Naked Eye”, “After Midnight”, “Pretty When High”, “We Need Love”, “Mountain”, “Who Do You Love”, “Flawless”, “Down to the Bottom”, and ended with “Freedom”. I will definitely be going to see Dorothy the next time I have the chance. Hailing from Frankenmuth, MI, Greta Van Fleet packed the Fillmore in Detroit for the 3rd night in a row on May 25th. I honestly don’t think I have seen a crowd as excited to see a band as this one! Comprised of brothers Josh (vocals), Jake (guitar), and Sam (bass), along with longtime friend Danny (drums), you could tell that they felt 100% at home on stage, especially because they got to be in their home state. 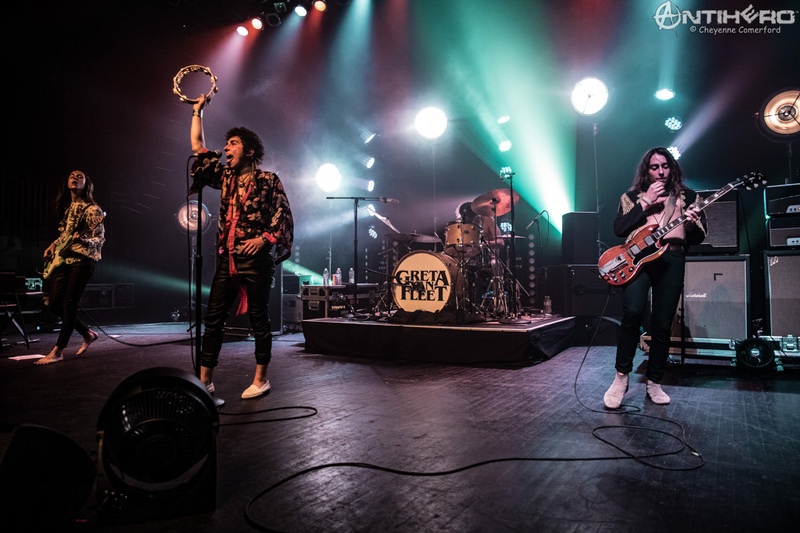 Greta Van Fleet opened with their first single, “Highway Tune”, which made it all the way up to No. 1 on the Billboard Mainstream Rock chart. With kind words from Elton John to Robert Plant, these guys have a lot going for them, and it’s well deserved. The talent of these guys is out of this world and makes everything they do look effortless. The rest of their set was the following: “Edge of Darkness”, “When the Cold Wind Blows,”, “Talk on the Street”, “Flower Power”, “You’re the One”, “Evil”, “Blues Jam”, “Maggie McGill”, “Killing Floor”, “Watching Over”, and “Lover Lover Taker Believer”. Then came the encore. The crowd went nuts and never stopped until they came back out to play the final two songs of the night. “Black Smoke Rising” was up first and EVERYONE helped sing along. Then came “Safari Song” to end the night off right, but not without Danny’s 4-minute-long drum solo to go out with a bang. Between Josh’s vocals, Jake’s guitar solos (I lost count of how many and how long they were), Sam’s talent on both bass and keyboard, and with Danny on the drums, these guys are ready to take over the world and have totally renewed my faith in the future of Rock N Roll. Go and check them out when they come to your town if you can get a ticket, that is!